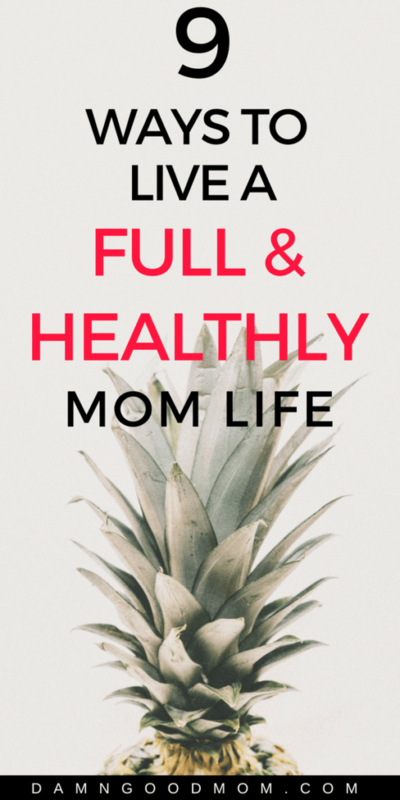 Learn how to live a full and healthy mom life, even when things are hectic and sometimes downright exhausting. Most of the time, my day begins before 7 AM and doesn’t end until after 10 PM. My toddler is a morning busy body and while I’d love to sleep till noon and pass out by 7 PM, mom life just isn’t set up like that. Raise your hand if you are a mom that understands. To get things done, moms often have to find ways to be flexible as Gumby, fast as The Roadrunner, and more creative and savvy than Bugs Bunny. And most of the time we manage it all. Often with grace and sometimes lots of caffeine. This method can work but it can leave you drained. Today, I want to share some tips that can help you make hectic mom life more enjoyable and healthy. Is it possible? I think so. Here’s how. Before I became a mom, my days were predictable. I knew what to expect each day and life was pretty calm. I kept a calendar and everything fit nice, pretty, and color-coded on my schedule. Now, I wouldn’t use a scheduling app that doesn’t make it easy to make changes and all paper calendars require the use of pencils with extra large erasers. Mom life is unpredictable. Even so, I found that having a plan for each day makes everything more manageable. Think of it like this. Each day you are trying to get somewhere and accomplish tasks and goals. Your plan is your map. You may have to take a few detours but you always know the destination. Without a map (or a plan), you can end up completely lost off track and frustrated. We don’t want that! Start each day with a plan and let it guide you through the day. If you have to make changes and rearrange things, don’t sweat it. Make a new plan that works better tomorrow. After I gave birth, I spent a few months out of work on maternity leave. I was healing from a natural childbirth and trying to figure out the best way to care for a newborn. I was exhausted, frustrated and in pain from breastfeeding. On top of that, I was not giving myself the self-care and grace I needed. My hair was a mess, my wardrobe consisted of yoga pants and loose tees, and I felt gross much of the time. 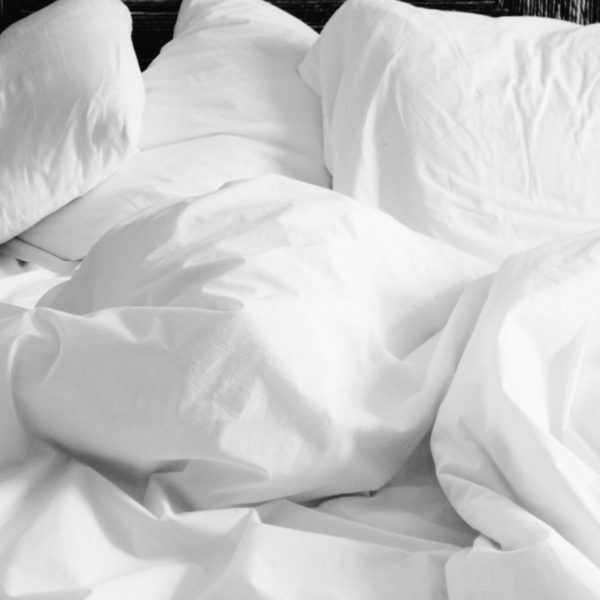 It took me some months to get back into a self-care routine and when I did, it felt good. Whether you are a new mom or have some years in the hood (motherhood), somewhere on your daily plan should be some time carved out for self-care. You can find a list of 25 fast and easy ways to practice self-care here. A happy family life is highly contingent on mom’s well-being. Meal planning is crucial for family health and mom-sanity. Health is wealth and it starts with a wholesome diet. Ensuring my family eats a wholesome diet has led to my dependence on meal planning. Am I in love with the process? Honestly, no. I’d rather be reading or napping. But, I know that if I don’t plan the meals for the week, it’s easy to fall into the fast food trap (I do fall) and fast food isn’t healthy food. Also, meal planning saves us so much money. I know this because I live in a household that believes in the power of budgeting. Having a good handle on your finances is a part of wellness. Before I understood the power of budgeting, I was unaware of how irresponsible I was with my hard earned coins. I was in debt (paying too much interest), spending hundreds on food (eating out several times weekly) and purchasing random things I didn’t need. Creating a budget helped turn all that nonsense around. My husband and I have worked hard to get control of our finances and live well on a budget that allows us to save money and enjoy life. The household budget helps our family communicate and control our money more responsibly. I highly recommend making budgeting a part of a healthy household. Budgeting is important; shopping purposefully is equally important. I’ve purchased items that I have never worn or used. How about you? This is evidence of not shopping purposefully. I encourage you to shop more mindfully and purchase things you need and will use immediately. Not only will you save money but you’ll probably notice that you have lots more space. Shopping with purpose is a process that may require you to change some habits like walking around the mall, shopping without lists, or getting sucked in at the Target dollar section. I’ve adopted a process for buying to things that have helped me declutter and reduce the amount of random stuff in my home. Does your family have lots of clutter? If so, it may be time to purge. I wrote a post on how to declutter your life for good and the principles are share have completely changed my life. Less stuff means more space physically and mentally. Decluttering doesn’t need to a one-day thing. If you have lots of clutter, consider decreasing gradually until you are only left with things that are useful and brings your family value. I’ll be the first to admit that it took me some years to get to a point where quality meant more to me than quantity. We live in a society that tells us more is better and therefore we should always be in pursuit of getting more. It’s crazy and untrue. Often times, we don’t need more, we need better lasting. I used to enjoy fast fashion, the clothes are inexpensive and trendy. The problem is many of the items don’t last more than a few washes. Therefore, I have to replace those items more frequently. Instead, it makes more sense to purchase items of higher quality, which may cost more upfront, but they will not need to be replaced as quickly. This principle holds true for almost every area of our home lives. Focus on quality and save money. Living a healthy life requires knowing what we are putting on bodies and inside our bodies. Lately, you may have noticed lots of products marketed as natural, organic, clean, eco, and the list goes on. We all just want to provide our families with quality products to use and eat without having to worry about pesticides or toxins. The easiest way to do this is to read the ingredients and understand labels. Is that natural product really good for you? Many poisons are natural, they aren’t good for us. I have invested in shopping at farmer’s markets, switching many of my family’s personal care products, and seeking out products with fewer ingredients that I can actually read and understand. It’s been a gradual process. Family life has a way of taking over and leaving little to no time for friendships. Before children, we made time for our friends and now as a parent, it may seem like time for friendships isn’t possible. It is. And tending to these relationships are important. If you have a friendship that you truly value, it will take an effort to not let it fall by the wayside. But, good people are hard to find and letting go of the ones who bring goodness and value to your life at the time when you can use it most is a bad idea. Sometimes, all it takes is a phone call to get a friendship back on track. 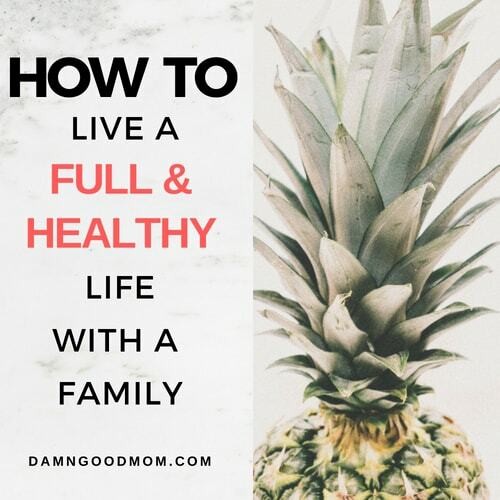 Alright, there it is, 9 ways to live a full and healthy life with a family. You can do this! Do you have any other ideas you’d add to the list? For more mom life and family life ideas, follow along on Pinterest.